and put them in a large pot. Since this was an impromptu craft, I wanted some simple directions and found them here. I liked how they just added the mordant (alum) directly to the dye (step 5 in the instructions) instead of getting out another pot and doing it separately as I had read in other directions. 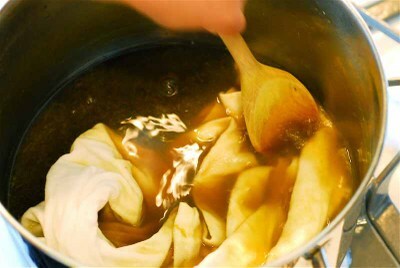 The mordant is the ingredient that sets the dye and an easy one to use is alum. It can be found in the spice section of the grocery store. 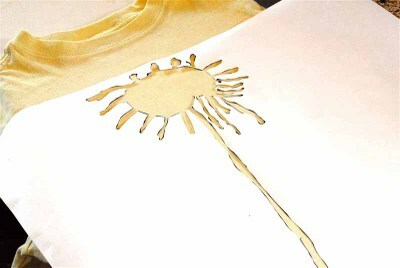 The finished T, dyed a light dandelion yellow! We thought we'd take it one step further and add a freezer paper dandelion stencil to the front. 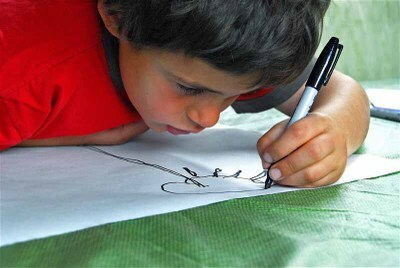 Little Brother has very limited vision and had to get up close to make his drawing. There are lots of good freezer paper stencil tutorials, here's a link to get you started. He's drawing directly on the freezer paper. Now, it's time to add the paint. 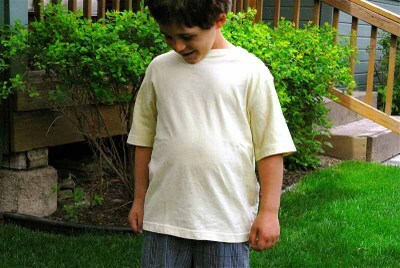 Put a piece of cardboard between the front and back of the shirt so the paint doesn't bleed through to the back side. Little Brother started dabbing on the fabric paint and then I helped to make it complete. Pull off the freezer paper, let the paint dry (follow directions on your fabric paint bottle for drying) and you have one happy customer! 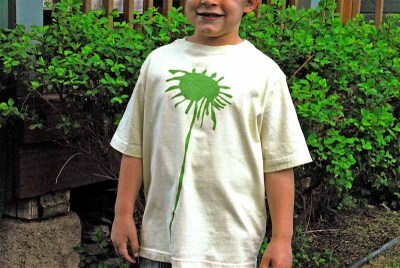 A dandelion drawing on a dandelion-dyed T-shirt! Hi - I am looking into making natural dyes for a project and I was wondering, with the one you made: how long does it keep for? I need to make it in a few days in advance of the activity. Love, love, love this shirt!!! 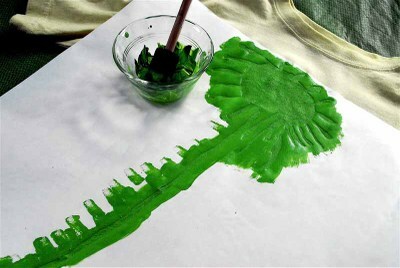 I would have never guessed it was made from the dye of dandelion flours and paint. Your son did a great job! Fantastically cute shirt! Great project! Well done! Oh, I love this idea! Dandelions are so happy! I love this t-shirt idea. 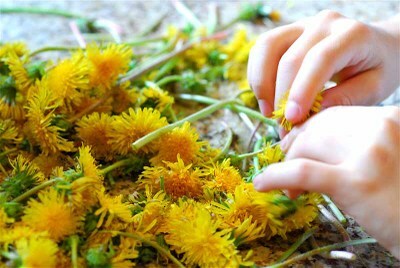 I have a little, special place for dandelions...they fall in my: if they're a pretty weed let them grow: philosophy. Happy Tuesday! The shirt came out great. I love the idea of using something 'free' from nature to enhance our lives. 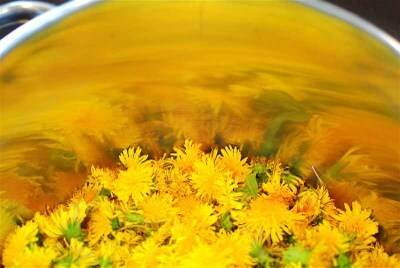 Have you thought about dandelion tea or eating the leaves too? I've only heard about those things- haven't had quite the courage to give it a try. Way cool, Little Brother...waaay cooool. You always ahve the beast ideas! 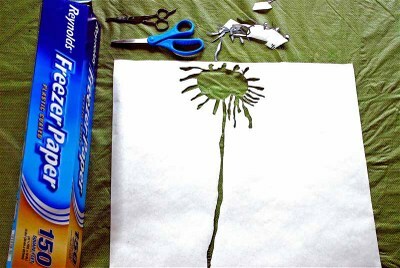 I'm going to do this with the kids for father's day (the stencil part anyway). We'll have to wait for more time to do the dying. All those dandis look so pretty in the pot! As does the shirt on your boy! 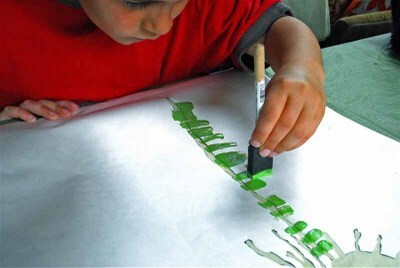 Can't wait to try some of that stenciling-I only bought 3 rolls of freezer paper over a year ago to try it! Must get started. This shirt is way cool! I would pay money for one! Such creativity there. wow. that is such a great idea. especially done in impromptu.